* Fun way to learn essential math skills about money. 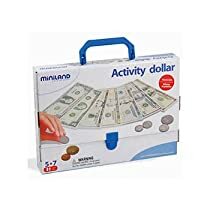 Each set includes 3 game series – total of 18 full color cards to reinforce visual recognition, discrimination and actual size plastic bills and coins (14 bills and 24 coins). This game includes actual size and accurately designed play money, as well as 3 matching games to: – reinforce recognition of each coin and bill (dollar bingo), – market games to support the values of each bill and coin to arrive at the correct price and – comparison game to introduce the concept of greater and less than.